Jo-El Sonnier will perform on the riverbank stage Saturday, Dec. 2 from 4-6 p.m.
It’s not a tradition, but it sure seems like one because the headliner on the Riverbank Stage on Festival Day is certainly someone with Louisiana ties. The past three years the headliners have all been Louisiana talents and come from across the state. Chosen to lead into the fireworks program in 2014 was Cole Vosbury of Shreveport and Season 5 star of The Voice on ABC television; 2015 featured Chicken on the Bone, a favorite band in the New Orleans area and last year would have been Springhill’s Joe Stampley of the Uniques and later a partner with Mo Bandy in Moe and Joe. This year is no different; headlining the festival stage will be Jo-El Sonnier, a singer-songwriter and one the country’s premier accordionists. Sonnier, who played here last year as part of a Christmas musical, is a Grammy award winner, Louisiana Music Hall of Fame recipient and native of Rayne-the Frog Capital of the World. The 71-year old Sonnier picked up his brother’s accordion when he was only three. When he was six, he performed on the radio and when he was only 11 he made his first recordings. He also released several independent singles and four albums as a teenager and has recorded more than 30 albums, primarily on independent labels. He also was an opening act for Country Music legend Merle Haggard. 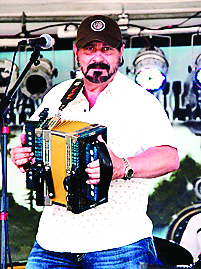 He has been the undisputed “King of Cajun” for the past 25 years and occupies a significant place in the rich artistic landscape of this country. His fans are undeniably dedicated, while the music industry elite – Dylan, Costello and Hank Williams Jr., to name a few, admire his work to no end. He is a “musician’s musician” with a wonderful gift to sing and entertain you in a way often imitated but never duplicated. In addition to his virtuosity as an accordion player, he also plays bass guitar, acoustic guitar, drums and harmonica. As a songwriter, Jo-El has had his songs recorded by artists such as Johnny Cash, George Strait, EmmyLou Harris, John Anderson and Jerry Lee Lewis. The sounds of his accordion can be heard on the albums of such great legends as Hank Williams Jr., Johnny Cash, Alan Jackson, Robert Cray, Neil Diamond, Mark Knopfler, Elvis Costello, Merle Haggard and Dolly Parton among others. Jo-El has lent his talent on the accordion to more than 100 Artist records. He continues to maintain a regular schedule as a session player.